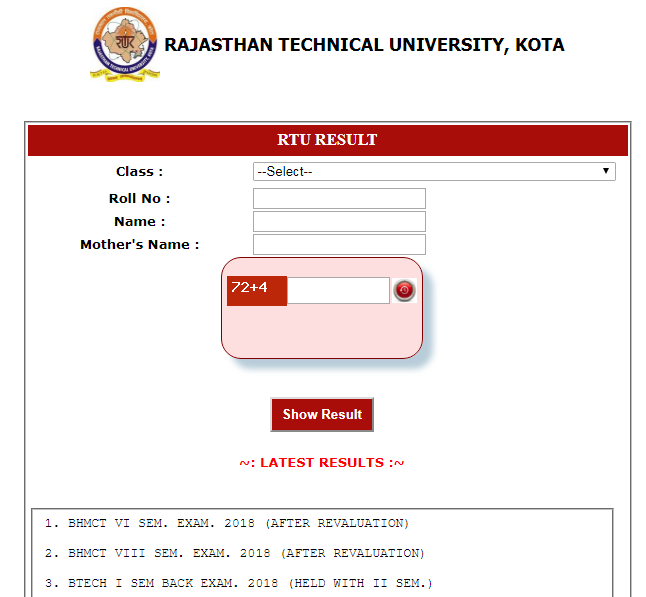 www.esuvidha.info: RTU 2nd Sem Result 2018, BHMCT 6th, 8th Sem -On it’s another official website specially designed to check results online @ www.esuvidha.info, Board of Controller of Examination, Rajasthan Technical University is continously release various courses and semesters result in today on 11th September 2018. To check the results online it is mandatory for all the candidates to select the Class name from the drop-down menu, Roll Number, Name and Mother’s name and fill up the captcha code at last i.e. 16+5. RTU Result 2018 is announced for BHMCT VI SEM. EXAM. 2018 (AFTER REVALUATION) AND BHMCT VIII SEM. EXAM. 2018 (AFTER REVALUATION) AND BTECH I SEM BACK EXAM. 2018 (HELD WITH II SEM.) AND BTECH II SEM. BACK EXAM. 2018 AND BTECH II SEM. MAIN EXAM. 2018 AND BTECH II SEM. REBACK EXAM. 2018. Prior to that, in this flow of continuous declaration, Result was announced on 29th August 2018 for B.Tech (Ist Semester Main Examination) – 2018 (after revaluation) and B.Arch Courses. And, before that on 20th August 2018, Board of Controller of Examination published the MBA and BTech other semester Results online. 19th August 2018 was indeed not one of the best days of the year for Rajasthan Technical University. As it was reported that RTU manages to fill only 32% seats in Engineering. Thus in 2018-19 academic session, it was the least percentages of candidates taking admission in it’s affiliated colleges, thus putting the University’s future in dark.